What is Camp Hopson Rewards? 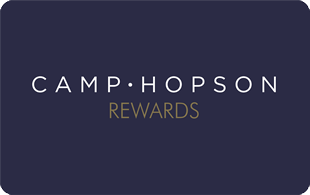 Camp Hopson Rewards is a loyalty reward scheme in which you’ll earn 3 points per £1 spent in the Beauty Hall, and 1 point per £1 spent across the rest of the store. You can join Camp Hopson Rewards at any counter in store. Please ask your Sales Advisor for details on opening your account. Alternatively sign up online today. Yes! All Camp Hopson customers are welcome to join. It will only take a few moments to complete the sign up, but you must have a valid email address to be able to redeem points. Your Sales Advisor will register your card when you open your account in store. You will not be able to redeem your points if your card isn’t registered to a valid email address. When will I be able to spend my points? You need a minimum points balance of £2.50 (250 points) to be able to redeem. Points in multiples of £2.50 can be redeemed at any time, at any participating department. If you do not wish to redeem your points can be saved to use at a later date. What can I redeem my points against? Any product full priced products at any participating departments. What do I do if my card has been lost, stolen or damaged? Contact one of our Sales Advisors in store as soon as possible and they will be happy to issue you a new card and transfer your points. Do Camp Hopson Reward points expire? Points have a maximum lifetime of 18 months – depending on when they were earned. For example: Points collected April 2017 to September 2017 (6 months) will be valid until September 2018. Any points not redeemed before the expiry date will be erased from the account. Can I collect points on all beauty products? You can collect points on all beauty products; beauty treatments at Londora Nail Bar and Eye Candy Brow Bar are excluded. Ask in-store for more details. If you forget your Camp Hopson Rewards card but still want to collect your points, your Sales Advisor will be able to access your account at the till and allocate your new points. I don’t have my card with me today, how do I redeem my points? You must present your Camp Hopson Rewards card at the time of transaction in order to redeem points.